Posted on Fri, Nov 18, 2011 : 5:59 a.m.
Washtenaw County officials are considering the creation of a countywide food policy council to address some of the health problems facing local residents. A recent survey showed the general health of more than 12 percent of the county's population is reported as being fair or poor. Meanwhile, 59.1 percent of adults in Washtenaw County — more than 163,000 — are considered overweight or obese, and that figure is growing. "Access to healthy food really helps us be able to help people all across the developmental stages keep their weight under control, which puts them at less risk for developing chronic diseases or getting into stages like pre-diabetes — which we know is on the rise for younger people and teens," said Sharon Sheldon of Washtenaw County Public Health. Sheldon presented the idea for the Washtenaw County Food Policy Council to the county board during a special working session Thursday night. She said the idea originally came out of discussions at Food System Economic Partnership Policy Committee meetings. One of the goals of a local food policy council would be to increase access to healthy food like fruits and vegetables for low-income and vulnerable residents. "We're looking at lots of different things as far as chronic diseases that are related to nutrition," Sheldon said. "And one thing we can say for sure is that food is one of those kind of very central issues that really does contribute to a person's health overall and their quality of life." The concept of a food policy council isn't new. It's been done in other communities, including in Detroit and Grand Rapids, and there's even a Michigan Food Policy Council. "We know that food policy councils are on the rise around the country, so this isn't an isolated thing," Sheldon said, adding there's definitely a need for one locally. Sheldon said food policy councils bring together a broad array of food-related groups — both public and private — to investigate every stage of the food system. "So it really looks very broadly from seed to table, from the growers to the eaters," she said. "And we know there are a lot of food-related groups here in Washtenaw County that are doing a lot of different things. We're looking for some more coordination across those groups." A local food policy council, Sheldon said, also would link with state efforts — such as the Michigan Food Policy Council, Michigan Good Food Charter, Healthy Kids and Healthy Michigan — to gain momentum on both state and local policy priorities. One of the goals, she said, would be to increase access to healthy foods for low-income and vulnerable residents. That would include making sure people who qualify for food stamps are applying for them, and that they can use them at places where fresh fruits and vegetables are sold — including farmers markets and grocery stores. Data presented at Thursday's meeting suggest the number of grocery stores in Washtenaw County is decreasing while the number of restaurants is increasing. "We're also looking at addressing agricultural regulations and ordinances to try to increase the local food supply," Sheldon said, citing the Michigan Good Food Charter as inspiration. Beginning in late 2009, three organizations — the C. S. Mott Group for Sustainable Food Systems, the Food Bank Council of Michigan, and the Michigan Food Policy Council — came together to work on developing specific goals for Michigan's food system. 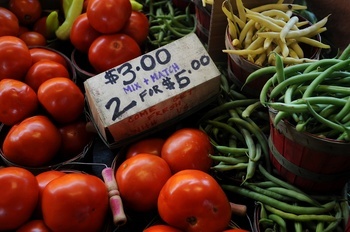 The Michigan Good Food Charter outlines six goals to achieve by 2020 and 25 agenda priorities. One of those goals is that Michigan institutions will source 20 percent of their food products from Michigan growers, producers and processors. Another goal is that 80 percent of Michigan residents (twice the current level) will have easy access to affordable, fresh, healthy food — 20 percent of which is from Michigan sources. There also are nutrition goals for school meals and a goal that Michigan schools will incorporate food and agriculture into their K-12 curriculum. Sheldon cited St. Joseph Mercy Health System as an example of a Washtenaw County institution that's doing well to source healthy food from local growers. "Probably if you've driven by their campus, you see that they have a farm on the site," she said. "They have a resident farmer. They have growing food that's going right into their hospital cafeteria. They're very interested in sourcing from local growers." Sheldon said one of the goals of a food policy council would be to encourage more of that behavior in Washtenaw County. Washtenaw County Public Health secured grant funding through the Michigan Department of Community Health in the 2010-11 fiscal year for the development of a food policy council. Sheldon said the county has been exploring the idea with FSEP ever since, and there's talk of using additional state funding to hire a part-time council coordinator. Commissioner Yousef Rabhi, D-Ann Arbor and chairman of the county board's working session, said he hopes to schedule another meeting in 2012 to more fully discuss the issue. Sat, Nov 19, 2011 : 10:06 a.m.
Is this such an issue of eduction? More than 12% of the highly educated people I know choose to eat quite unhealthily, and to not exercise in any way. They are apparently making a choice to indulge regardless of the known consequences. Sat, Nov 19, 2011 : 3:20 p.m. In my experience, eating unhealthily, or not exercising (or smoking, driving at excessive speeds, not wearing seatbelts, etc.) occurs due to ignorance of the consequences (uneducated) or due to knowledge of the consequences but choosing to proceed in the imprudent behavior nonetheless. Still, not all &quot;educated&quot; people are educated about everything, so some of them are ignorant of their unhealthy behaviors and their consequences even though they may be very well-informed otherwise. By educating the public, you improve (but do not guarantee) the odds that healthy behaviors will adopted. Fri, Nov 18, 2011 : 11:04 p.m.
Would I support this? Only if it costs the taxpayer nothing and does not attempt to establish any food regulations that are more restrictive than state law. County residents would be better served by liberalization of suburban zoning laws to permit backyard gardens so that residents can grow their own nutritious foods. Fri, Nov 18, 2011 : 6:19 p.m.
Fri, Nov 18, 2011 : 4:23 p.m.
Food Policy Council (FPC) of Food Police Commission (FPC)? Fri, Nov 18, 2011 : 6:47 p.m.
Fri, Nov 18, 2011 : 5:53 p.m.
Food Policy Council (I assume you meant &quot;or&quot; not &quot;of&quot;). Fri, Nov 18, 2011 : 2:10 p.m. Thank You Comrades for looking out for us! The struggle of the working man against the evil &quot;Wall Street Crowd&quot; has forced us to eat more junk food than healthy food and now we are over weight. We can only blame the &quot;RICH&quot; for Forcing junk food down our throat! Please have more countywide food policy councils, one is good but three councils would be much better and show that you REALLY Care! Fri, Nov 18, 2011 : 1:42 p.m. I'm from the government, I'm here to help you. These subjects have been covered by many other organizations, so why do we need redundancy? Buried in the text is the line &quot; That would include making sure people who qualify for food stamps are applying for them&quot;,again redundant and very revealing. Stop wasting our taxes and come up with something original and useful. Fri, Nov 18, 2011 : 1:59 p.m.
Fri, Nov 18, 2011 : 1:36 p.m. Sat, Nov 19, 2011 : 12:15 p.m.
Fri, Nov 18, 2011 : 1:02 p.m.
Thu, May 10, 2012 : 9:12 a.m. I commend Sheldon's proposal to establish a Food Policy Council for the county. It seems that the County has identified some critical issues facing the local food system, including a decrease in supermarkets carrying fresh foods, difficulty in accessing food stamps, and a rise in obesity rates in the area. I strongly believe that these are symptoms of a broken food system and that in order to address these issues, there needs to be systemic change. Too often, problems are seen as isolated issues and dealt with separately from each other. However, it may be more effective to address via a food policy council, which can connect multiple sectors/experts/affected people to come up with a solution. If cost of nutritious food is an issue (and it clearly is), a food policy council may be a way for the community to advocate for more affordable healthful food. Certainly there isn't a quick fix but we want to make sure that food is available for all in the long term. Fri, Nov 18, 2011 : 5:13 p.m.
Actually there have been studies showing farmers market tomatoes as being less expensive than those of equal &quot;value&quot; sold at the grocery store. Junk food is also not less expensive. A wholesome diet of fresh-whole food can be less costly in many ways than empty calorie food. A mini fat-sugar-mystery filled hamburger costs $1 on the dollar menu while a local-fresh apple costs @.50. People eat &quot;junk food&quot; mainly because they crave the fat and sugar and it may be all that is available to them and/or they are not informed enough to make healthy choices. I have been in the hospital many times and disgusted at what passes for food and at times the only options were bad ones. Sometimes government needs to keep the food industry in check because they feed our school cafeterias, hospitals and communities. People must also take responsibility for what they choose to eat. Perhaps we can strike a balance? Government keeps an eye on the corporations and we keep an eye on our own health choices. But we have to be informed in order to make intelligent choices. Food commercials and labeling make it very hard for some people to make educated choices. Maybe one part time county employee, who needs a job by the way, could be effective in finding ways to provide healthier food options and education to those who are in need. The salary would be outweighed by the cost of medicaid expenses we tax payers incur when high risk lower income adults eat poorly thus causing all sorts of medical concerns and chronic illness. Tax payers pay for it one way or another. I do not have the answers but it takes a little effort on all fronts to engage a broken system in conversation. I am just happy to see and hear the conversations! By the way...one part time salaried worker will spend money in our county and will pay taxes. Just sayin. Fri, Nov 18, 2011 : 2:45 p.m.
As @average joe noted above, the tomatoes shown are $3 per container, not apiece. Fri, Nov 18, 2011 : 1:45 p.m. Sooner or later they will force you! Fri, Nov 18, 2011 : 1:01 p.m.
&quot;Access to healthy food really helps us be able to help people all across the developmental stages keep their weight under control,&quot; Eating less and exercising more does the same thing. Fri, Nov 18, 2011 : 2:41 p.m.
That is simplistic. The answer is eating nutrient-dense, low calorie (for the volume) food and, yes, exercise more. Unfortunately, for a variety of reasons, a lot of the easily available, affordable food is nutrient-light and high calorie. The nice thing about produce is that, for the most part, it fits the bill for being nutrient-dense and low in calories. Fri, Nov 18, 2011 : 12:25 p.m. So glad washtenaw county is going to spend the extra money money in their budget to look out for us sheeple. We are so lucky to have them in our lives. Fri, Nov 18, 2011 : 12:05 p.m. I don't think this is necessary. Seems to me the FSEP is an appropriate, non-governmental non-profit group to publicize and serve this role. If it wants to extend its mission to promote local foods to the local public as a healthy choice that's fine. But, I don't see the need for their mission to be melded into the county when the economy is difficult. It seems to me the Public Health department's study grant is coming to a close and the County needed something to show for it. This is bureaucracy at its finest. Get some money to pile up some statistics and then create a new bureaucracy. It starts out with a &quot;part-time&quot; staffer and then balloons into an expensive bureau of questionable purpose. If 12% have fair to poor health, 88% have good. Doesn't sound like a crisis to me especially as I don't think a locavore nutrition program is going to drop that 12% figure all that much. Further, with the influence of Universities and employer health incentives, there are lots of programs already in the area on good eating practices. As for obesity figures, they are inflated by a misused body mass index figure. Using the BMI, Calvin Johnson of the Lions at 230 lbs and 6' 4&quot; is considered borderline obese. BMI has its purpose but everybody has grabbed it and is using it to justify whatever programs it wants. Fri, Nov 18, 2011 : 2:35 p.m.
Actually, for population assessments, BMI UNDERestimates the percentage of people who are overweight or obese. Almost all (95-99%) of those determined to be overweight or obese by the BMI are, in fact, overweight or obese if their % body fat is determined (the gold standard for determining if someone is overweight or obese). Many (51-64%) of those, however, with a normal BMI are actually overweight or obese when their % body fat is determined. See International Journal of Obesity 32 (6): 959–966 (June 2008). For a more comprehensive discussion of BMI (including discussion of the above information), see <a href="http://en.wikipedia.org/wiki/Body_mass_index" rel='nofollow'>http://en.wikipedia.org/wiki/Body_mass_index</a> . The bottom line is that BMI is VERY useful in calculating prevalence of overweight or obesity, particularly in populations. If anything, it underestimates the problem. Fri, Nov 18, 2011 : 11:57 a.m. I'm still wondering why those tomatoes cost $3 a piece. So, what they want to do, and will do, is spend the money on another study and committee and take it from the human services and humane society to do it? We don't manufacture products anymore in this country, we manufature committees, consultants, boards, studies and experts. Sat, Nov 19, 2011 : 8:28 p.m. Sorry A2Susie, I've seen heirloom and those ain't them. I grew some pretty nice tomatoes this year too. I guess I'll have to have a farm stand next year, then add a few buildings the year after. There's money to be made!! Fri, Nov 18, 2011 : 10:56 p.m. I don't see what's so bad about encouraging ppl to eat a tasty fresh tomato sandwich with sliced cukes on the side, instead of ham and cheese with chips on the side. Making sure their food stamps can be used at Farmers Markets is win-win for buyers and farmers. This is an educational effort, not a law! Fri, Nov 18, 2011 : 10:45 p.m.
Those are heirloom tomatoes with real taste. They don't travel well, they are delicate, so they will never appear in your supermarket. These are the tomatoes your great grandparents grew, whose seeds would be lost to posterity if our local farmers were not willing to grow and sell them. Try one. You might be pleasantly surprised, at $3.00/lb or per basket. Worth it! Fri, Nov 18, 2011 : 2:18 p.m.
What's in a basket? What size is the basket, like a quart or pint? Fri, Nov 18, 2011 : 1:56 p.m.
Those tomatoes are $3/ basket...just like those beans.